You’ve probably heard of Game of Thrones. If you haven’t, it’s a cultural phenomena that has reached almost unparalleled heights, with a highly anticipated new season of the HBO series starting in July, four new HBO spin offs in the works, and a long awaited sixth book being written (albeit painfully slowly). Whether you’re an avid reader of the books or a binge watcher of the show, you’re no stranger to the Dire Wolf of House Stark, the Lion of House Lannister, the Three Headed Dragon of the Targeryens. Maybe you even know that a giant in shattered chains means you’re facing an Umber or that three dogs on yellow means you should probably run because one of the Clegane brothers is coming. All of the prominent families, and even some of the not so prominent families, of Westeros have their sigils. A house’s sigil is put on everything; tunics, belt buckles, cloaks, and maybe most importantly flags. 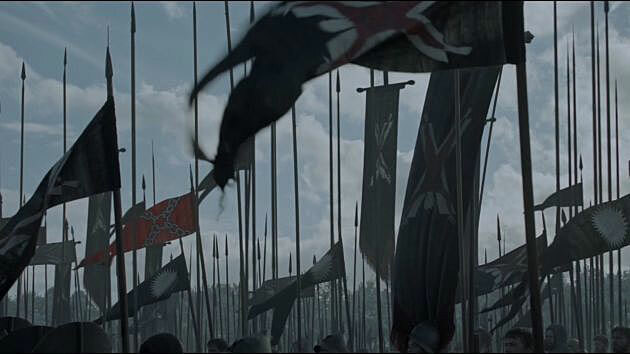 If you’re watching the show, there’s not a scene that goes by without some sort of custom flag making an appearance, whether it be a gonfalon hanging in a great hall or flag bearers proclaiming the arrival of a house’s army. Flags featuring sigils are proudly hoisted over castles. Most often, this is just a point of pride with long reigning families proudly displaying their family’s sigil over their ancestral lands. In times of war, this serves as a means of identifying who is currently in control of a castle. 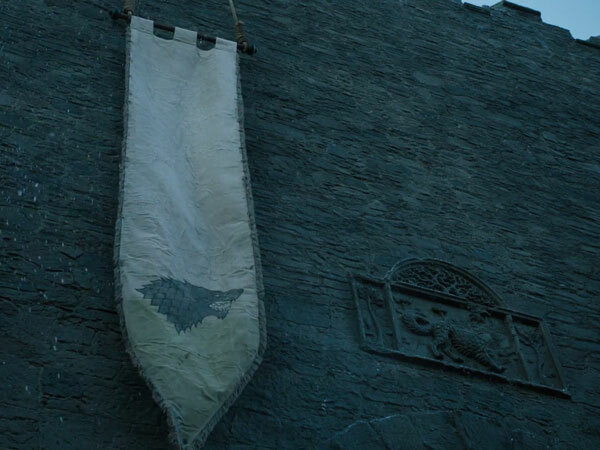 Without giving away any spoilers, whenever certain houses take a castle from another house, the first thing they do is raise their sigil over the castle, whether it be a lion, a stag, or even a flayed man. When you start to examine the flags used in the show, you’ll notice that different types of flags are used for different purposes. For example, a gonfalon is used decoratively and can often be seen hanging behind the high table in a castle’s great hall. They can also be seen adorning the outside of a castle’s wall, like in the image of the Stark dire wolf gonfalon. When watching scenes of armies marching into battle, you’ll probably notice a lot of forked flags. This design is aptly called birds mouth because the shape resembles the mouth of a bird. This is where you will usually notice the most sigils. The armies don’t carry just the sigils of one house, but of every house sworn to serve to that house. For example, in a Stark army you would of course see the Stark Dire Wolf, but you would also see the Bear of house Mormont, the three trees of house Cerwyn, the giant of house Umber and many others. The lord that the other houses are sworn to is called the liege lord. Since each house carries its own banner during a march, the proximity of a house’s banner to that of the liege lord’s can act as a status symbol. The closer your house’s banner is to the liege lord’s, the more boasting rights you have. Every house wants to be closest to the liege lord to show that their house is of the highest value. House sigils are not unique to Game of Thrones. Throughout history, families have used symbols as a means of distinguishing themselves. Even today, people can find their own family crest flag or sigil based on their lineage and surname. While you may not find yourself hoisting your family crest flag over a newly captured castle, they make a lovely addition to homes and a great gift for anyone who is proud of his or her lineage! An array of flags featuring the sigils of houses who have sworn fealty to the flayed man of House Bolton. 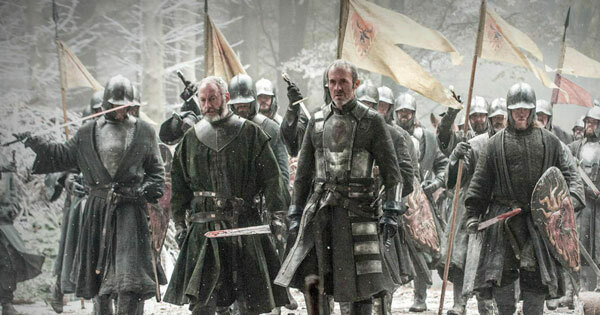 King Stannis Baratheon with his army at his back. His birds mouth style flags feature his royal sigil: the stag of house Baratheon surrounded by a flaming heart to represent his devotion to the Lord of Light. A Stark Dire Wolf gonfalon on the outer walls of Winterfell. Whether you’re looking for a gonfalon, family crest flag, or anything in between, you can find it at Gettysburg Flag Works! We carry a number of high quality flags and banners to suit every taste. Feeling creative? Want to create your own Game of Thrones flag or banner? Let your true fandom shine through by creating your own custom flag! Have questions? Give us a call at 1-888-697-3524 or send us a message online. We look forward to assisting you! Victoria Kunert is a recent graduate of Siena College where she earned her B.A. in English. She hopes to continue on to earn her M.S. in Information Sciences. She currently works for Gettysburg Flag Works in the Sales and Customer Service Department. In her free time she enjoys reading and hiking.